by Diane - April 5th, 2019. April through to May sees many of our gardens transformed into a rainbow of welcome colour as tulips bloom. With 245 gardens with tulips open across England and Wales for the National Garden Scheme there are plenty to choose from, so we have selected a few to get you started. The Yeo Valley Organic Garden at Holt Farm, Blagdon in Somerset is one of only a handful of ornamental gardens that is Soil Association accredited. With 6½ acres of contemporary planting, quirky sculptures, bulbs in their thousands, purple palace, glorious meadow and posh vegetable patch it also has great views and green ideas. Open on Sunday 28th April 2-5pm. The Old Rectory, Netherbury in Dorset is a 5 acre garden designed and maintained by present owners over the last 25 years. Spring bulbs including species tulips and erythroniums are a speciality. They have several open days in April and May. Blackland House in Calne, Wiltshire, open on the 1st May, is a wonderfully varied 4½ acre garden adjacent to River Marden. There is interesting topiary, trained fruit trees and specialist displays of historic tulips and unusual spring bulbs. Dunsborough Park, Ripley, Surrey has a spectacular tulip displays in the meadow. This magnificent 100-acre estate comprises a series of historical gardens brought to life through vistas and garden architecture. Their tulip opening is on Wednesday 17th April for the National Garden Scheme. Great Dixter House, Gardens & Nursery at Northiam in East Sussex was designed by Edwin Lutyens and Nathaniel Lloyd. Christopher Lloyd made the garden one of the most experimental and constantly changing gardens of our time, a tradition now being carried on by Fergus Garrett. Spring bulb displays are of particular note. Open for the National Garden Scheme on Sunday 19th April. Sandhill Farm House in Rogate, West Sussex has front and rear gardens broken up into garden rooms including small kitchen garden with gorgeous displays of tulips. Open on both Saturday 13th and Sunday 14th April. Broughton Grange, in Banbury, Oxfordshire has a large terraced walled garden created by Tom Stuart-Smith in 2001. Good early displays of bulbs followed by outstanding herbaceous planting in summer. There are formal and informal areas which combine to make this a special site including newly laid arboretum with many ongoing projects. As a member of the Society of Garden Designers, Charles Rutherfoord has created the garden at 51 The Chase over 30 years. In 2015 the main garden was remodelled to much acclaim. The garden is spectacular in spring, when 2000 tulips bloom among irises and tree peonies and it has open days on Sunday 28th April and Thursday 2nd May. Ulting Wick in Maldon. 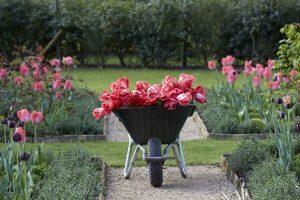 Essex promises thousands of colourful tulips and flowing innovative spring planting at their openings on Sunday 28th April and Friday 3rd May. It was voted one of the 100 Best Gardens to visit in the UK in Garden News Magazine. Netherall Manor, Soham Cambridgeshire is an unusual garden appealing to those with historical interest in individual collections of plant groups which includes old English tulips. They have open days on Sunday 7th April and Sunday 5th May. Alswick Hall in Buntingford, Hertfordshire is a listed Tudor House with 5 acres of landscaped gardens set in unspoiled farmland. At their opening on Sunday 14th April you can enjoy herbaceous borders, shrubs, woodland walk and wild flower meadow with a fantastic selection of daffodils, tulips, camassias and crown imperial. The Old Corn Mill, Ross-on-Wye, Herefordshire is 4 acres of woodland, meadows, ponds and streams. A tranquil and relaxed country garden of scents, sights and sounds. Interest all year with drifts of tulips at their April openings. The Mount at Bishop Castle, Shropshire is an acre of garden that has evolved over 24 years, with a view that sweeps down the valley over fields and then up to the Long Mynd. Daffodils and tulips abound at their opening on Saturday 27th April. Court House, Stretton-on-Fosse in Warwickshire (open as part of Stretton-on-Fosse Gardens) is a 4 acre garden with year-round interest and colour. Extensive and varied spring bulbs, herbaceous borders, spring beds, fernery and a recently redesigned and restored walled kitchen garden. Open on Sunday 14th April. John’s Garden at Ashwood Nurseries, nr Kingswinford, Staffordshire, A stunning private garden adjacent to Ashwood Nurseries, it has a huge plant collection and many innovative design features in a beautiful canal-side setting. Open on Sunday 21st April. Gorsty House in Powys is a garden with planting to attract wildlife. With wooded and shady areas, herbaceous borders with abundant cottage garden planting, hundreds of bulbs in season which you can see at one of their many openings in April and May. You can read more about their love for bulb planting here. Borders bursting with late spring colour can be found at Glebe House in Abergavenny, Gwent at their May openings (18th & 19th). Set in an AONB in Usk Valley there is a south facing terrace with wisteria and honeysuckle, decorative veg garden, orchard and wildflower meadow in development. Also in Gwent, High Glanau Manor is a listed Arts and Crafts garden laid out by H Avray Tipping in 1922. Original features including impressive stone terraces with far reaching views over the Vale of Usk to Blorenge, Skirrid, Sugar Loaf and Brecon Beacons. The Old Vicarage at Whixley, Yorkshire is a delightful ¾ acre walled flower garden that overlooks the deer park. Gravel and old brick paths lead to hidden seating areas creating the atmosphere of a romantic English garden. They open for the National Garden Scheme on the 6th & 8th May. Abbeywood Gardens, in Northwich Cheshire is in a superb setting near Delamere Forest. It has approximately 4½ acres of gardens surrounding large Edwardian House with vegetable garden, exotic garden, chapel garden, pool garden, woodland garden, lawned area with beds. No. 2 Ferndene in Tyne & Wear are open by arrangement for groups of 10 or more to view their tulips. There is also woven willow work – a willow arch, fencing and gates, plus a woven willow ‘barrel’ feature in the garden. A willow ‘hide’ was constructed on the edge of the pond in 2017. To visit this garden please contact the owner in advance to arrange a suitable date. The National Garden Scheme gives visitors unique access to 3,500 exceptional private gardens in England and Wales, and raises impressive amounts of money for nursing and health charities through admissions, teas and cake. Thanks to the generosity of garden owners, volunteers and visitors we have donated a total of £58 million to nursing and health charities, and made an annual donation of £3 million in 2019. Our beneficiaries include Macmillan Cancer Support, Marie Curie, Hospice UK and The Queen’s Nursing Institute.